There are multiple artists using the name 'Santa' on last.fm: 1) A Spanish heavy metal band fronted by a female singer Azuzena. The band born by the hands of two Ob?s members, Fernando S?nchez and Juan Luis Serrano, when they saw an Hurac?n gig where Azuzena was singing in 1983. The first line-up only recorded a demo in 1983 under the name Viuda Negra. Shortly after they changed their name to Santa. Their most succesful release was Reencarnaci?n that sold 17,000 copies in the first pressing. 1) A Spanish heavy metal band fronted by a female singer Azuzena. The band born by the hands of two Ob?s members, Fernando S?nchez and Juan Luis Serrano, when they saw an Hurac?n gig where Azuzena was singing in 1983. 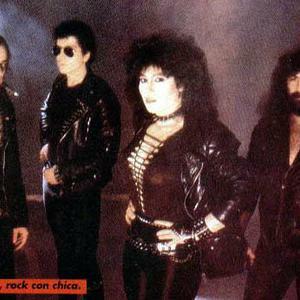 The first line-up only recorded a demo in 1983 under the name Viuda Negra. Shortly after they changed their name to Santa. Their most succesful release was Reencarnaci?n that sold 17,000 copies in the first pressing. 2) For the indie rock band from Illinois, please update your tags to Santah. 3) Father Christmas. Some novelty Christmas songs use this name. 4) Artist featured on the Jormungand OST. Best known for the line "Her name is Koko she is loco, I said oh no"